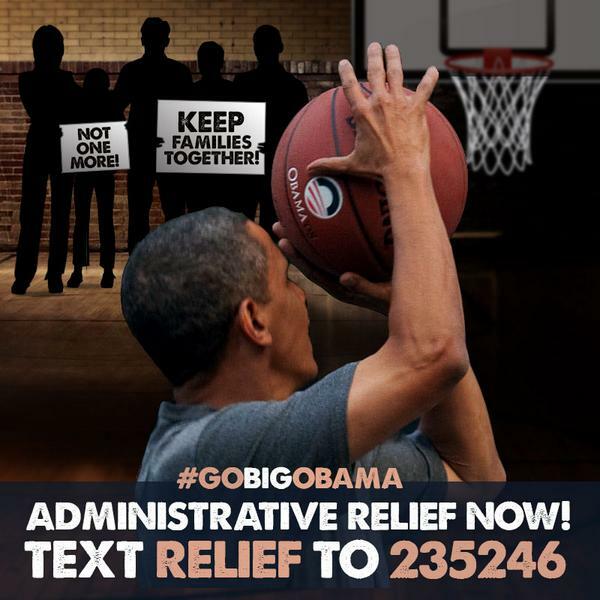 The drumbeat by activists for the president to "go big" administratively is getting louder and louder. But what does it really mean and what do they want? President Obama is expected to soon announce a series of executive actions that would change U.S. immigration policy — after months of anticipation from activists, and increasingly heated questions from the GOP about whether he has the authority to do so. But beyond that often used phrase, activists say they want substantive changes to the current system, especially a reduction in the Obama administration's record deportations. And they think some form of legal status could be granted to millions of undocumented immigrants living in the United States. In interviews, immigration activists generally advocate for a two-pronged approach. The sought after changes would alter how the Department of Homeland Security enforces existing deportation policy, and expand the 2012 program that gave millions of young undocumented immigrants legal status. When Obama announced the administration-wide review of immigration policy earlier this year, it was only after intense pressure from immigration groups to his left — activists forced him into a corner on the deportation issue. Whether their expectations are met could resolve a major source of tension for the president, or it could exacerbate it. The core component most activists say they want to see is deferred action for the parents and spouses of U.S. citizens, as well as the parents of DREAMers. Those changes would represent a significant expansion of the Deferred Action for Childhood Arrivals (DACA) program instituted by the president before the 2012 election; DACA gave work permits and relief from the threat of deportation to undocumented youth who were brought to the country as children. Marielena Hincapié, the executive director of the National Immigration Law Center, said that's a start but it must go farther. "I think that will be part of it, parents of U.S. citizens, but I don't think they can stop there; they can try," she told BuzzFeed. "There are also parents of DREAMers, and the vehicle for that to happen is deferred action." Hincapié also talked about expanding the use of parole in place, a U.S. Citizenship and Immigration Services policy that was formally recognized in 1998 and is granted sparingly. Parole in place means that "your unlawful entry need no longer bar you from applying for adjustment of status," according to legal website NOLO, and can be granted to undocumented immigrants who are already physically present in the United States. The policy can also apply to families of military members. Additionally, Hincapié said the extreme hardship waiver, which only applies to family members of U.S. citizens, could also be expanded. Latino lawmakers have also called for an expansion of parole in place, giving the example of a deferred action recipient who marries a U.S. citizen and doesn't have to leave the country to apply for a green card. There is also a real desire among activists to see the president provide legal status to the 9 to 10 million undocumented immigrants that would receive that status in a bill passed by the U.S. Senate last year. Though some have reservations about whether Obama would go that broad with the actions. "The NILC is thinking much broader," Hincapié said. "We believe he has strong legal footing to provide broad and expansive relief like the 9 to 10 million in the Senate bill. As long as the administration can develop a clear set of criteria like family ties or ties to the U.S. workforce, I can see that businesses would want workers to be included even if they don't have citizen family members." Lorella Praeli, director of advocacy and policy at immigrant rights organization United We Dream, said "going big" means that the Obama administration would protect as many people as possible and give them work permits. "For us it means protecting people who have community ties to the United States," she said. Praeli echoed what Hincapié said about using different frameworks as a guideline for providing relief from deportations including family ties, longtime residency, and the Senate bill. She added that DACA should be revamped because some people, like well-known activist Jose Antonio Vargas, aged out and were not eligible for legal status from the program. She said her organization believes 6 to 8 million people could be protected by the president, rather than 2 or 3 million. Erika Andiola, the activist who confronted Republican Rep. Steve King Aug. 4 in Iowa, said immigrant organizations have worked with lawyers to spell out what Obama can do. She brought up the controversial Secure Communities program, which allows law enforcement who stop people for minor offenses to fingerprint them and review their immigration status. The program allows detention and facilitates deportations. "We don't want it to be the smallest fixes, though any fix is good. We don't want him to just fix a little bit of Secure Communities, when he has the power to get rid of it. We want him to expand deferred action to as many people as possible," she said. While deferred action is the main focus for many advocates, changes to how Homeland Security enforces immigration policy, they say, could also make a difference in the lives of undocumented immigrants. A whole host of policy changes have been floated, though it is unclear which ones the administration is considering. A letter from Latino lawmakers earlier this year suggested forgiving immigrants for reentry violations, or periods of unlawful presence in the United States despite now having a certain lawful status. The letter also suggested clarifying the extreme hardship waiver, refining prosecutorial discretion, limiting deportations without hearings, and ending Secure Communities. Before the enforcement reforms were delayed until after the summer, the Los Angeles Times reported in April that changes being considered were altering the timeframe for priority removal of an undocumented immigrant from three years to two weeks, considering family ties in deportation cases, and adding bond hearings for undocumented immigrants who are detained. But since then, the influx of unaccompanied minors at the U.S.-Mexico border has become a national issue. According to lawmakers, White House officials have argued on Capitol Hill this summer that before the executive actions, the administration must act on the border — which suggests the current border situation will play a role in Obama's calculus on the issue. Praeli said votes by House Republicans to repeal DACA before they went on recess only strengthened the resolve of activists to get the president to make substantial administrative changes. "We know based on what happened that Republicans' real intention all along has been mass deportation. The party is unwilling to change and live in the moment in 2014," she said, adding that it represents an opportunity for the president. "We want him to come clean with the immigrant and Latino community: Do you want to be a champion for this community or do you want to go down as deporter-in-chief?"